Riley Damiani knows the scouts are watching, and he couldn’t be more enthused about the added attention. 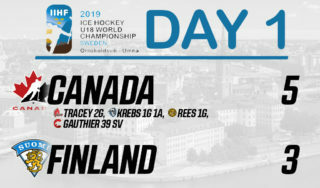 The 17-year-old Mississauga, ON native is in his second campaign with the Kitchener Rangers in 2017-18, a season which also doubles as his NHL draft year. For some players, the pressure that comes with attempting to finally achieve the ultimate goal of hearing your name called during the NHL Entry Draft can be daunting. 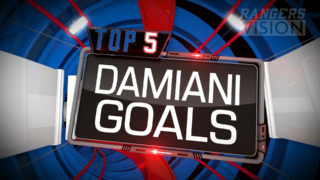 For Damiani, it’s a pressure – but also a thrill – knowing that goal is at his fingertips. Riley Damiani skates up the ice during a game against the Oshawa Generals on November 18, 2016. It certainly seems like it’s done just that for the second round, 29th overall pick of the Rangers in the 2016 OHL Priority Selection. He scored in his first game of the season, and followed that up by enjoying a three-game point streak, tallying four points. He’s already surpassed his goal total from his rookie season, (nine in 2016-17, 11 as of December 12), and is just two points shy of last season’s total of 22 in 30 less games played. He registered a career high three-point game on Remembrance Day – a goal and a pair of assists – vs. the Windsor Spitfires, and also tallied his first two-goal game just over a week later against the North Bay Battalion. 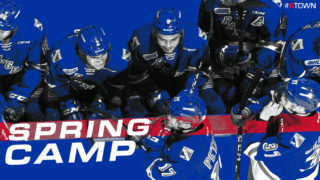 Time after time he’s found himself drawing into the team’s top-6, and he appreciates the fact that the added responsibility also comes with the added opportunity to learn from teammates who have achieved their dream of being drafted by an NHL team, like Adam Mascherin. “I’ve played with some guys who are big and strong,” said Damiani of past linemates over the years. “Guys who go into the corners for you and really dig out pucks. I’ve also played with others who play a real shut-down, defensive type game. Riley Damiani celebrates his goal on October 29, 2017 vs. the North Bay Battalion. “Getting to play with a guy like Adam Mascherin who has that unreal skill, that just gives you a whole other look out there,” he praised. “Every time you step out onto the ice with him, you think the puck is going in the net. He’s a goal scorer, but a great play maker too. He has the ability to find you out there and help create chances not only for himself, but for his teammates. In his second Ontario Hockey League season the sophomore has embraced everything he’s learned from teammates, but is quickly becoming acclimated to the grinds of the season and how to best prepare for the challenges that face a player in a 68-plus game year. Off-ice preparation was something he knew he wanted to focus on after his rookie taste of major junior. “I focused on getting better in the gym and getting better on the ice,” he said of his off-season workouts. “Every little thing I did in the summer attributed to where I am at this point. With a goal, a +1 rating, and four shots on goal Riley Damiani was named the game’s Third Star on October 29, 2017 vs. the North Bay Battlion. “Last season I wasn’t really settled in and comfortable in the league until about halfway through the year,” he reflected. “You’re still learning and trying to get everything going; get your hands going, gauge the speed of the game at this level. But this year things came along quicker because I knew better what to expect. I feel like that gave me a big advantage. It’s one goal, but it’s not the only goal of the former Mississauga Rebel. 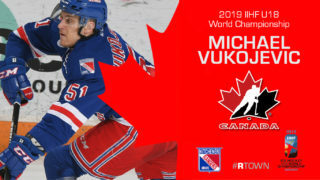 He, as well as the rest of his Rangers teammates, know the expectations of passionate Rangers Nation weigh heavy, but he’s confident in how the team will achieve the success that both the fans and the team want. Riley Damiani visits The Aud on his first official day as a member of the Kitchener Rangers after signing his OHL Standard Player Agreement on June 2, 2016. The next Kitchener Rangers SPOTLIGHT will feature forward and Kilworth, ON native Eric Guest.